Eric Lau and Brent Mondoskin are both students at Michigan State University where they study with Joseph Lulloff, James Forger, and Andrew Speight. Both are very active chamber musicians who have performed at both regional and national North American Saxophone Alliance conferences. With their saxophone quartet they have been National Prize winners in the Music Teachers National Association Collegiate Chamber Music Competition and semi-finalists in the Fischoff National Chamber Music Competition. Dedicated to Valeri Popov, the Duo Sonata was written for two bassoons in 1977. 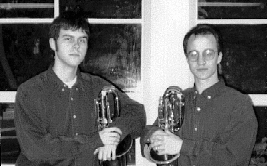 Then, in 1994, the composer scored it for two baritone saxophones.